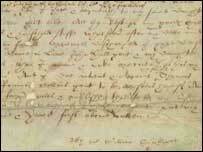 Rare examples of William Shakespeare's signature in a will are among important historical papers now available online. 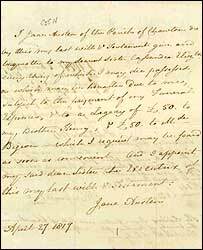 The document, which is joined by one million others, has been put on the web by the National Archives. Shakespeare's will reveals how he bequeathed his second-best bed to his wife, Anne Hathaway. Wills from Jane Austen, Sir Christopher Wren and Horatio Nelson - the latter's with a personal diary - can also be viewed at DocumentsOnline. The documents span six centuries of British history from 1384 to 1858. Internet users can search and download digital images of original documents for a small fee, including Napoleon Bonaparte's will. 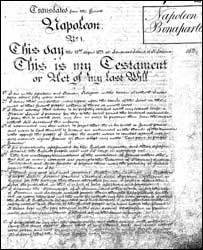 The will of John Julius Angerstein (1735-1822), a merchant banker, is also on display. When he died, his collection of 38 paintings was sold to the British government for £57,000, forming the nucleus of what is now the National Gallery. Although the wills are available to the public on microfilm at the archives' Kew headquarters in west London and the Family Records Centre in Islington, north London, this is the first time most of them have been put online. It marks the completion of a two-year project to provide online access to the documents. Shakespeare's will has been available on the internet for a while but the latest project has made it much easier to access. "This is a fantastic resource that can bring history so much closer to us," said TV personality Tony Robinson, who presents the archaeology programme Time Team. "I've no doubt it will turn into a cult website. We can now all be historical researchers in the comfort of our own homes." Mark Pearsall, family history specialist at the National Archives, said: "Wills are one of the most important resources for family and local history research - a will may provide names of spouses, sons, daughters and grandchildren, help to clarify family relationships or indicate the place of burial." DocumentsOnline also contains government papers newly released after 30 years under lock and key.